The Super Bowl is just 50 days away. 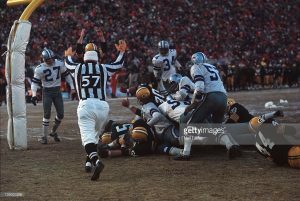 So, let’s look at the Super Bowl from 50 years ago to honor this not that significant occasion! Miami’s Orange Bowl played host to Super Bowl II on January 14, 1968. The game pitted the NFL champion Green Bay Packers against the Oakland Raiders of the American Football League. In 1967, the NFL had 16 teams divided into four divisions. Thus, the Packers were in their first season as a member of the central division. That division composed of the Pack, Lions, Bears and Vikings now called the NFC north exists to this day. (It included the Tampa Bay Buccaneers from 1977-2001). The NFL/NFC central division was known for its tough hitting. So, it was dubbed “the black and blue division” virtually from the outset. While Green Bay’s defense was as strong as ever in ’67, the offense was up and down. 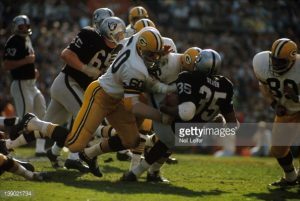 The departure of future Hall of Famers Paul Hornung and Jim Taylor hurt Green Bay’s rushing game. Hence, they had four backs with at least 77 carries and none with more than 466 yards on the season. 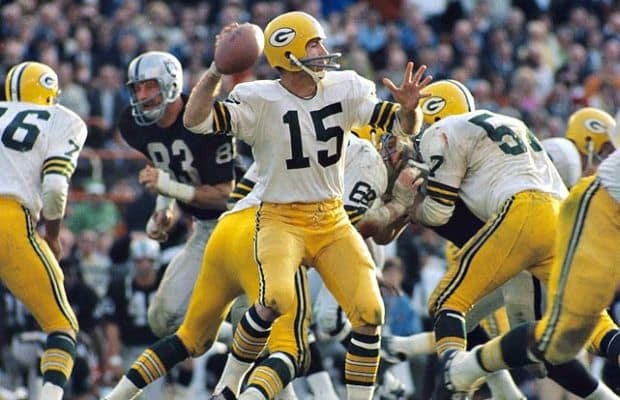 Their lack of a rushing attack impacted Bart Starr’s effectiveness as he tossed only 9 touchdown passes along with 17 interceptions. But, when the games counted, Green Bay prospered. In one of the coldest games in league history, the Packers outlasted Dallas, 21-17. Green Bay scored with just 16 seconds left from the one on a QB sneak by Starr. Rightfully, it goes down in history as one of the greatest game-winning drives in one of the greatest NFL games of all-time. Oakland dealt with no adversity on their road to the 1967 AFL championship. They cruised to a 13-1 record. Subsequently, they trounced Houston in the championship game, 40-7. The Raiders’ offense fielded a strong unit. 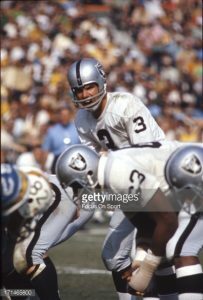 At quarterback was the “mad bomber,” Daryle Lamonica. They fielded playmakers like Hewritt Dixon, Bill Miller and the amazing Fred Biletnikoff. Their defense was solid too. In fact, John Madden was their very young linebacker coach! The stage was set for Super Bowl II. 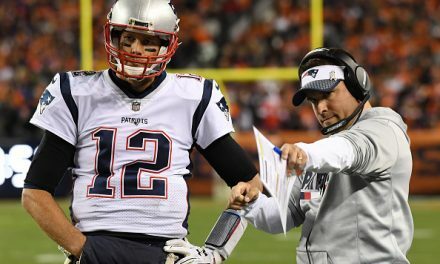 Oddsmakers made Green Bay huge favorites for the second straight season and they lived up to the hype. The difference in the game came down to three things – big plays, turnovers and field goals. The Raiders punted on their first three drives. But, they held their own on defense…until Starr hit Boyd Dowler for a 62-yard touchdown in the middle of the second quarter. The big play gave the Pack a 13-0 lead. Oakland bounced right back with a great 78-yard drive where Lamonica was 5-for-5. Ultimately, he hit Miller from the 22 cutting the Packers’ lead to 13-7. However, Green Bay scored twenty consecutive points. Their last score came on a Willie Wood pick six. The second half turned into a coronation as a truly great era in history was coming to an end. Vince Lombardi’s Packers were the first dynasty of the Super Bowl era. Green Bay set the bar. They were well-coached. They played fundamental football. Likewise, they crushed their opponents while they were down. So, Lombardi’s guys carried him off the field after the win. 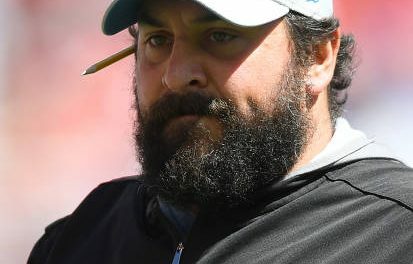 It was his last game on the Pack sideline. His legacy speaks for itself as the Super Bowl winner receives the “Lombardi Trophy.” Sadly, three years later, he passed away from cancer. As an organization, the Packers drifted into mediocrity. Consequently, they sniffed the playoffs only a few times until Brett Favre joined the club in the early 90’s. The Raiders, on the other hand, emerged as a power for the next two decades. 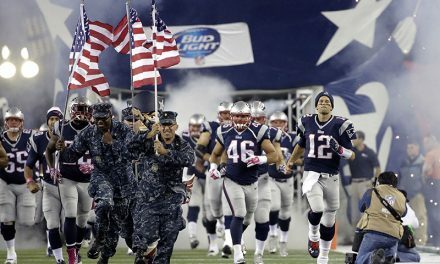 They won three Super Bowls over eight seasons and from 1967-1986 held the highest winning percentage in all of sports. Tomorrow, we’ll discuss the iconic Super Bowl from 49 years ago. 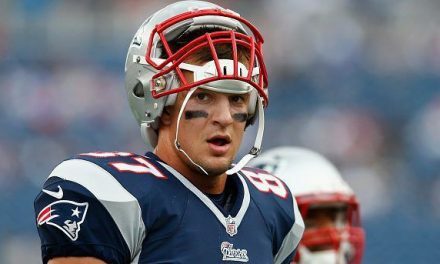 Does Rob Gronkowski Deserve Better?